Cheryl Paton is an artist who believes in creating positive designs. She also likes sharing artistic tips and techniques. 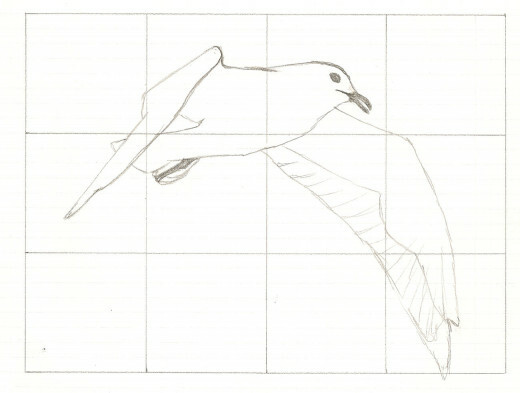 Seal Gull drawing using a grid. 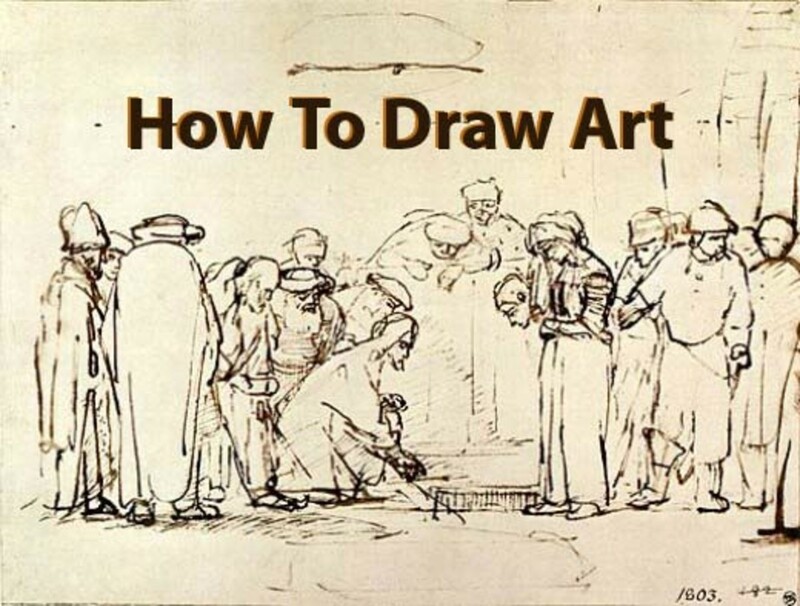 Are you looking for a way to help your drawings be more in proportion? 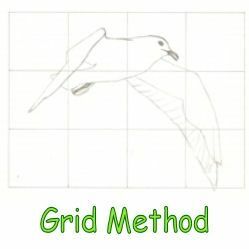 Grid method drawing can help you achieve that. It's a method that uses grids. The grids are lines that make up squares, like you see on graph paper. I like using two grids; a grid over the picture that I'm working from (on a clear sheet), and a grid on the sheet that I'm drawing on. My first grid is a document sheet protector with a grid lines drawn on it. I place this grid over the picture I'm drawing from. The second grid is the one that I'll make the drawing on. This grid will either be larger or smaller than the image that I'm drawing from. I had finally given myself permission to be an artist. There I was, an adult, finally giving permission to my lifelong dream. 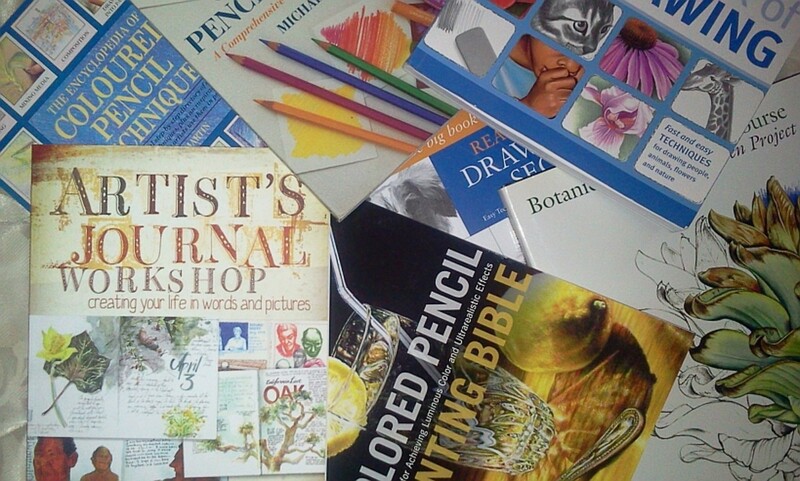 I went out and bought art supplies; paper, pencils, canvas, brushes, paint, etc. And I began. Some of my first drawings were laughable, yes me and my family actually laughed at them. But that wasn't where I wanted to be. So I practiced, and practiced, and bought art books, and read, and practiced some more. My art gradually improved. People started saying I had talent. "Talent," I chuckled. I considered talent something I was born with. The desire I was probably born with. Talent as far as art went, was work. It took lots of practice to get to where I wanted to be. Anyway, although my artwork has greatly improved, I had still struggled with proportions, especially when it came to people. I did free hand drawing and loosened up, and that helped. But it really helped to start paying attention to proportions and using grids to further me along my path. Using the grid method help me, and perhaps it will help you too. Sometimes I start with a freehand drawing. Other times I start with a photo that I've taken. Either way, I like using a drawing book that opens flat. It's better to draw on a page that doesn't bend when you're trying to draw on it. This book comes in an 8 x 8 inch, and also 12 by 12 inch size. The cover is from a light bulb painting that I did, to represent good ideas. When I use the grid method, I like using a vinyl grid sheet over my original. A vinyl or plastic grid provides a see through sheet. I use document protectors to draw my re-usable grid on. They are not only see through, they provide a pocket to place my picture in that I'm working from. If you have a flat clear sheet without a pocket, you tape the image to it. If you are going to use tape, I recommend low tack painter's tape. It doesn't leave a residue and is more easily removed. You can choose from a box of 50, 100, or 200. Clear sheets are the ones that you draw the grid on, to be placed over the picture or drawing that you are working from. The completed vinyl grid is see through, and reusable for your images. The grids can be made in various sizes. Using a fine tip permanent marker and a straight edge, draw an evenly spaced grid onto the document protector. Placing a sheet of graph paper inside the pocket is very helpful for this step. I made various size grids, ranging in size from 1/4 inch squares to over 2 inch squares, using a new document protector for each size grid. If the original drawing or picture is more intricate, then a smaller spaced grid can be more helpful to notice the various details. Grid on clear sheet is placed over the photo. I select the appropriate size grid sheet. Are you making the image larger or smaller? If something has a lot of details, I might go with a smaller grid scale to transfer from to a larger scale on my drawing paper. The other thing that determines what size grid sheet I use to place over my original, is how much bigger or smaller do I want the image to be that I am going to draw. If I am transforming the image to a larger scale, then I will need a smaller grid over my picture, and a larger grid on the sheet that I will be transferring the image to. And visa versa; if I am making a smaller final image, then I will use a larger scale over the original and a smaller scale on the new surface. On this drawing, I didn't need detail, I was going for the outline, and I just needed the image of the bird. As you can see, the bird takes up a three by four square area under the document protector grid sheet. This grid sheet was made with one inch squares. 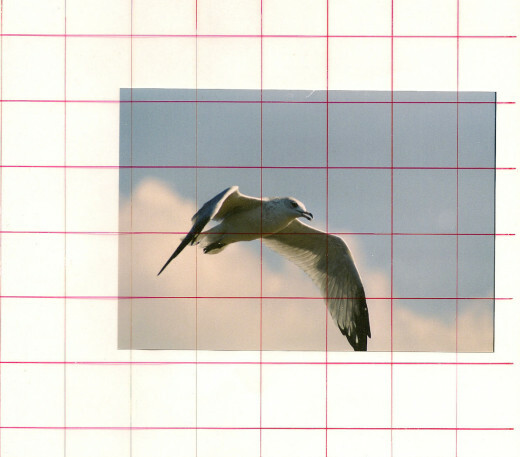 The gull was drawn onto a larger grid. I draw the image onto graph paper. Using graph paper gives an easy foundation for drawing the new grid. I prefer drawing my first draft onto graph paper instead of onto the final surface. I like using graph paper as it provides straight lines and I just measure and draw the desired scale onto the graph paper. This way a bunch of lines don't have to be erased and/or covered up on my final surface. With the bird image, I wanted to enlarge it. The document protector sheet that I used was a one inch scale. I wanted to double the size, so the scale I drew in pencil on the graph paper was a two inch scale. Both the document protector sheet and the graph paper would have a three by four square area on them, just different size squares. I multiplied the three by four inch area, by two. So the rectangle I drew onto the graph paper was six by eight. Then I drew lines inside the rectangle that were two inches apart, thereby making my scale on the graph paper with two inch squares. Connect the dots:If you need help with the drawing at this point, you can use points (dots) to help get you started. If you look at the top of the birds neck, it intersects with the top center line just a little over halfway up in that square. Make a dot there. Going to the left, the top part of the wing is pretty much in the center (going from left to right) of that square and about one fourth of the way down. Place a dot there. Coming down from that top dot and a little towards the right, but not near as far down as the first dot (the one by the neck), place another dot. You've got the idea. Measure, look, calculate, place a lot. Then connect them paying attention to whether the lines are curved, straight, wiggly, etc. It can be a bit rough, you can smooth the lines out as you go. This is just your graph paper drawing. Once you get all the lines like you want them, you can go over the lines that you want to keep with a fine tipped marker. This will make the lines bolder and darker, and will be easier to see underneath your final surface. Using Graph Paper Helps To Line Things Up. Drawings made from using the grid method can give a more realistic drawing. If your original image is smaller than the clear document protector, placing a sheet of graph paper inside, behind the image, can help you to line things up. You can also secure it in place to the graph paper with a small piece of low tack tape. Choose from 4, 5, 6, 8, and 10 squares per inch. 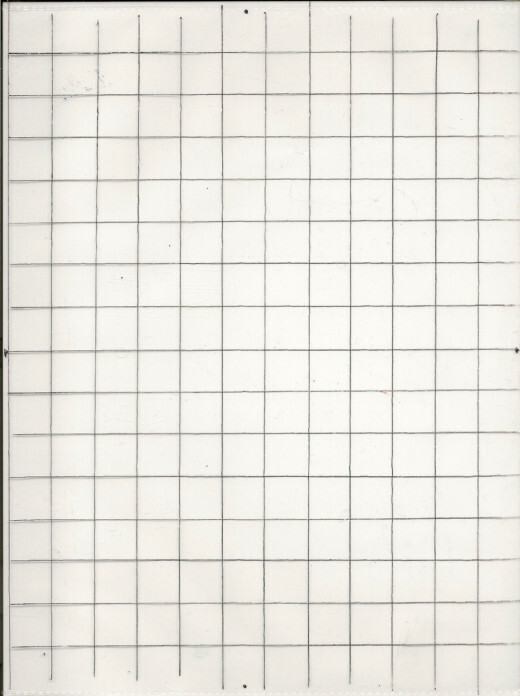 Some graph paper pads come with two sizes of squares. The front side of the paper will be one size and the back side will be another size. I prefer mechanical pencils for my drawing pencils. Mechanical pencils don't need sharpening. With a click or two you've got more lead and are ready to draw again. The thickness of the lines stays thin and consistent. The lines are also dark enough to see through the light tracer for transferring the image that way. You can also go over the final lines with a fine tip marker, if you need help seeing them when you make the transfer over to the final surface. The twist erase provides a longer eraser that is included in the pencil. A definite plus if you ask me. It takes a little more time to change colors, but if you have a drawing that is going to be in color in the finished product, then taking this extra step will make your designing easier in the end. Colored lines can help to identify what an object is, and also what color you might like to paint it or color later. A flexible ruler is great for making curved lines. Curved lines can look more uniform and smoother. I can bend the flexible ruler in tight places, and trace the inner and or outer edge to get smooth, evenly spaced, curved lines. I have found the ones with measurements on them to come in handy as well. You may not need to draw in every line in your preliminary. I was going to make a striped coveralls, and saved all my curved lines for the coveralls until the final drawing. I use Safe Release or low tack painters tape for easy release. Once the dots have been connected and/or the rough draft drawing completed, I smooth out the image. I round any lines that need rounding, I erase extra marks that aren't needed, etc. Then I darken the lines I want to follow if they need darkening. Then I line up the graph paper drawing with the surface that my final drawing/image will be on. This is where I may need to shift the paper a little bit to get my final image where I want it to be on the final surface. I use a couple of pieces of low tack painters tape to hold the graph paper drawing to the back of the final surface, if needed. It keeps things from shifting around, especially when the different pages are different sizes. Sometimes I re-use the safe release tape many times, making it economical as well as efficient. The smoothed out drawing is ready to transfer. Light helps the transfer image to be seen more easily. I then place the transferred drawing (the one on the graph paper), along with the final drawing surface, onto a light box. My darkened lines are the ones I trace onto the top side of the final surface. If I am making a colored painting and or colored drawing on canvas, I trace the image with watercolor pencils. Any watercolor pencil marks that didn't get painted over can easily be wiped off the canvas with a damp paper towel when the painting is completed and dry, when I paint with acrylic. If I am making a drawing with markers. I just use the appropriate colored marker(s) that I want. Before I got the light tracer box, I used to tape images up to a window. The tracer box is much easier. Some days when the sun is super bright, it's harder to see the image on top of the light tracer box. On those days, I usually either close the curtains or use the window method. Watercolor paint is easily painted over and blends right in. Leftover edges of lines made with watercolor pencils can easily be wiped off of the canvas with a damp paper towel, once the painting has dried. I like having a variety of colors to choose from. Final Surfaces for the design. Once my graph paper drawing is finalized, I transfer the drawing onto my clean final surface. The finished drawing, painting looks so much cleaner. I used to do sketches right on my final canvas before, with regular pencils. The lead smeared, and sometimes blended into the paint, making extra steps to clean up my colors on my final surface. This is why I take the extra steps to design and create on the graph paper, and then only transfer over the lines that I actually want, and in color if need be. It has made a big difference in the final look and in reducing the work on the final surface. The gull has been transferred to canvas and painted in. The finished sea gull painting looks majestic. I traced the final bird outline onto acrylic canvas with a black watercolor pencil. 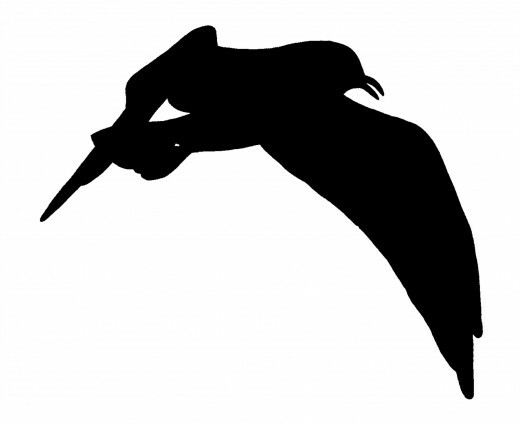 I filled in the drawing with black acrylic artist paint, making a silhouette of a flying seagull. Once completely dry, I wiped off any remaining watercolor pencil marks from the canvas. I made any touchups with white acrylic artist paint. 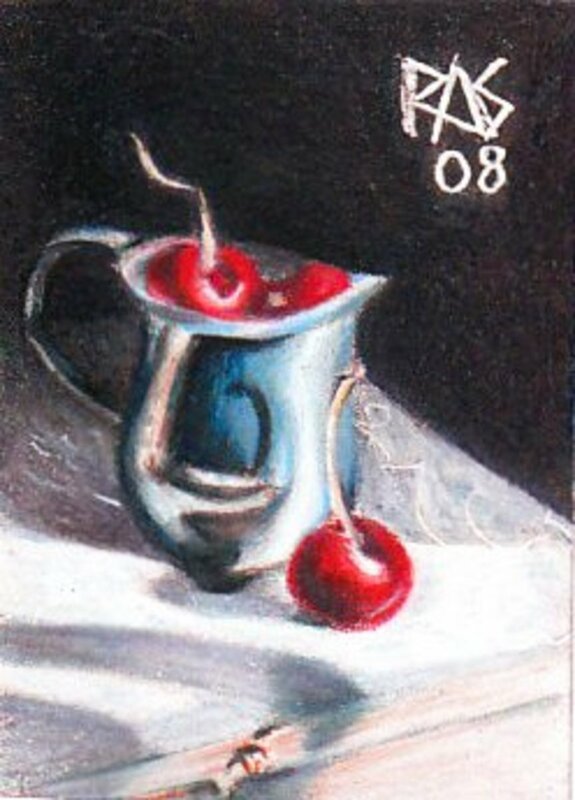 This is a copy of the completed painting. 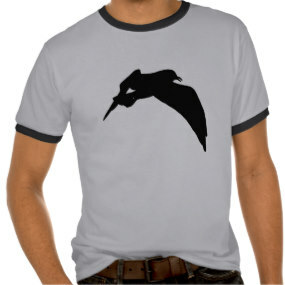 I uploaded the sea gull to various products on Zazzle. The seagull becomes a drawing, then a painting, and then a product. After I finished my grid method drawing of a sea gull, my transfer of it onto canvas, and the painting it in, I scanned it in on my computer and then added it to products in my online store. If you would like to order this design on any products, visit http://www.zazzle.com/CherylsArt*/ and search for sea gull in the Search this store box. 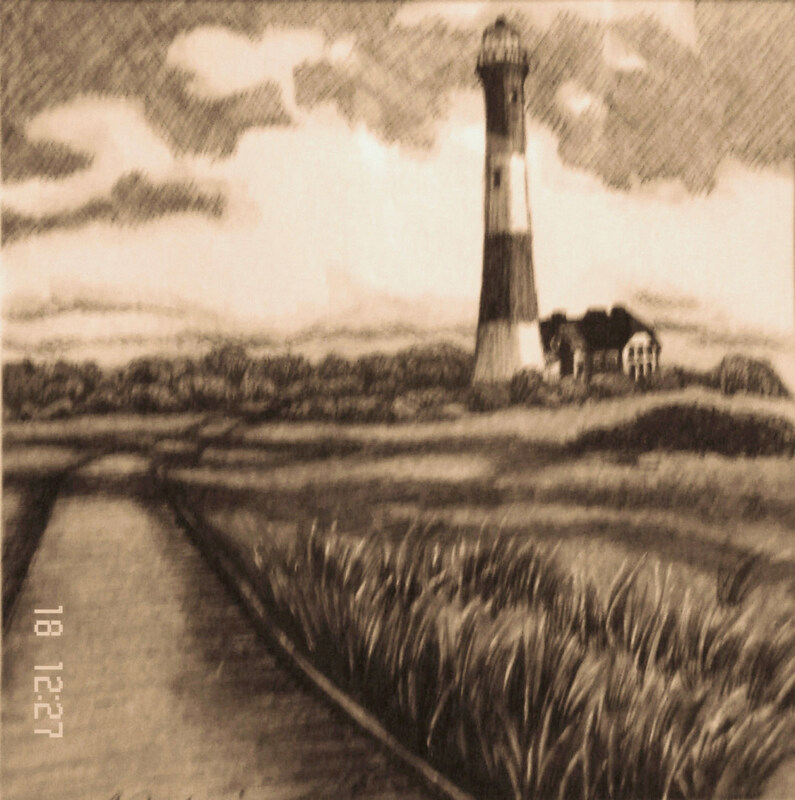 If you would like it on any other products, you can contact me through my Zazzle store. Whether you're using the grid method or not, these drawing tips can be helpful to any body. Look for and pay attention to shapes. Even an eye that a lot of people will just think of as an almond with a circle in it has shape to it. There can be ups and downs in the bottom of the eyelid as well as the top. Light may be hitting the eyes, showing as little triangles or dots. If you are doing a closeup of a person, pay attention to the iris. Is there a darker outer ring? Are there various colors in the iris? Compare the relationships the different shapes have to other shapes. Is the bottom of the nose perfectly in line with the bottom of the years? Does the nose line up with the middle of the chin? Where do the corners of the lips line up in relation to the eyes. Use this technique whether you're drawing a face, buildings, a bicycle, etc. See where things line up in relation to what else is there. Practice, practice, practice. Do what it takes. Trace over pictures. Use the grid method. Draw things freehand. And keep at it. Some people may be born with an artistic set of skills; others aren't. But if it's what you want to be, then it's worth it. Go for it. Keep at it. Practice helps. Have you ever drawn using a grid before? - Your questions and comments are welcome. I use a grid now and then. I probably should do that more often. Thanks for the reminder. I really like your dots idea, too. I will definitely do that when I get back to drawing & painting. Too busy converting lenses to hubs right now. Tips are very nice about grid drawing..
@fotolady49 lm: Thank you fotolady49 for checking back. Yes, I have the comments set up for approval. It would be nice if the computer would show that. I think, sometimes it does. @fotolady49 lm: That sounds like quite a project. Such a great idea! Congrats on the A+. I agree, grid method drawing is great practice for learning proportions. I left a comment about a project that I did in art school a few minutes ago and not sure if it will get posted or not, it disappeared in cyber space, didn't show if it was posted or had to be approved....I'll check back later and if it doesn't get posted maybe will try to repost my remarks if I remember to do so. When I was in art school we had a few assignments using this method. I agree that it is a good way to learn proportions. We also did kind of a reverse grid project where we had to make a collage, then grid that off to pick a detailed area. Once we selected our detail we had to grid that off and then produce a large colored pencil drawing. It was challenging and fun and took about 50 hours to complete but was worth it! I also got an A+ on the project!!! I love how you organized your drawing tips in short easy to read bites. This is an excellent tutorial. Even I could do this...thanks! my younger son loves drawing. will show him this useful lens. Masking tape placed on denim(blue jeans) works just as well as blue painters tpe and costs less. For those of you who find using the grid drawing method useful and also own an iPad, iPhone or iPod touch, CopyIt v2.0 has been released today on the App Store. Many new features have been added at the request of studio artists, such as the ability to print directly from within the App, Grid numbers and letters, 7 grid colors, zoom into any grid square with a touch and an option to highlight the current grid square while dimming the rest. Just search for CopyIt on the App Store and take a look! A lot of great instruction, tips, and resources. Thanks! Very good instructions. I have used grid method for drawing myself some times; it helps a lot, when you are not a born artist. xD I haven't thought of flexible ruler, though - thanks for mentioning. I also used grid sometime for scaling. Useful information for artists and designers. Thanks for for sharing those info. Thanks for making drawing look easy! I wanted to tell you about a website that I created where you can draw alone or together with others in real time on a huge page in cyberspace. Check it out globalDoodle.com or learn more on the lens (globalDoodle) or facebook. Great Lens, I have found grids very useful! Thank you for sharing. There is a great app for this for the iPhone called "Artists Grid Tool". it will let you place a customizable grid over any image on your iPhone or iPad. I use this method anytime I draw from a photo. It's great! Great lens. Cheryl, I am back to let you know that I featured this lens today on facebook at: Homeschool Fun for Tweens and Teens. Cheryl, this is so helpful. I had learned to do a grid method years ago, but without all the techniques here. You have certainly made the process more logical. Thanks. We will be giving it a try. Very informative, with lots of useful information and tips. I like how you tell just why you prefer a certain type of pencil, etc. I don't have an ipad yet, but learning from this lens just how useful it can be is encouraging. I have a cheap light projector, and find it hard to get very detailled results. Using your grid system looks like a better method. @anonymous: Thank you Nigel for that helpful info for iPad users. If you like to draw using the grid drawing method and you own an iPad, there is a useful App available on the App Store called CopyIt for iPad which replaces the need to draw grids onto printed photos. You can change your grid color, grid size, line width, zoom level and much more. Just open up iTunes and search for CopyIt for more details. This would certainly help when sometimes my drawings get a little-lopsided. @Addy Bell: AddaptAbilities, I think you must be referring to a stretched canvas on a frame. If so, I checked it out. 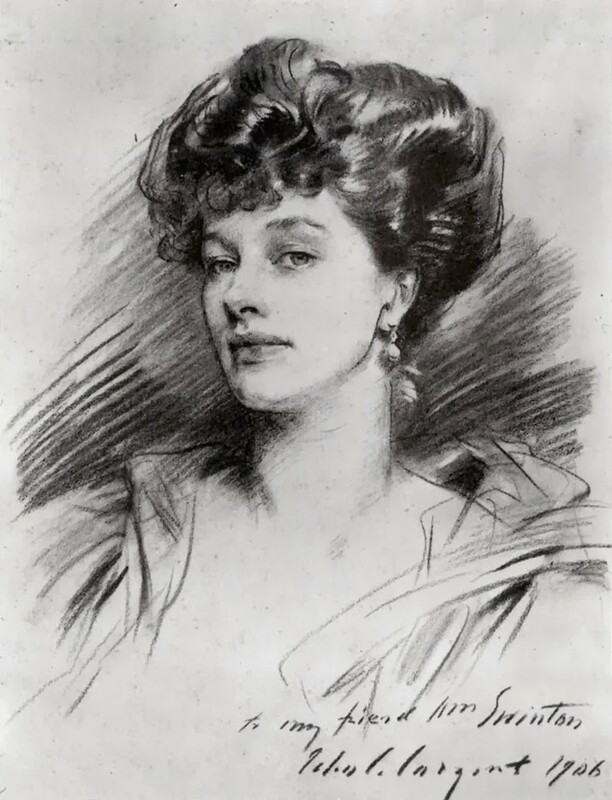 With a regular drawing laid directly on the light table, the drawing didn't show through to the canvas. When I placed the preliminary drawing right on to the back of the canvas, the outline did show through. The only portion that would show through however, would be where there isn't any frame. I've never worked from a grid before, but I've always wondered about it. How do you apply this method on canvas? Is is translucent enough that the light from the light board shines through? Does using a light table limit the size of canvas that you work on? Very useful instructions for budding artists. Welcome to the Art &amp; Design Group.